Summer is the season for enjoying everything outdoors and under the sun. It’s a time for backyard parties, family picnics, and lots of dreamy hammock lounging. 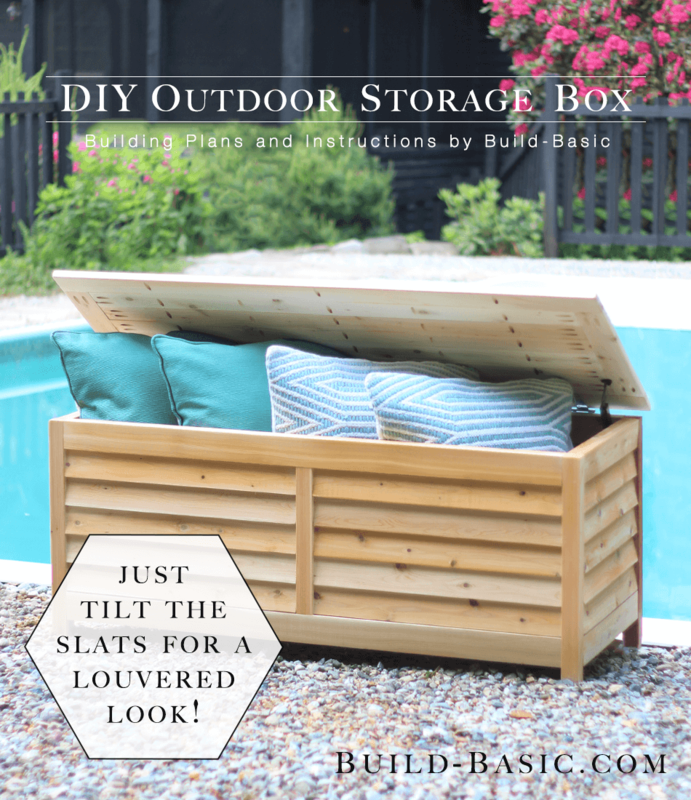 You don’t need a zip code in the Hamptons or oceanfront abode in Big Sur to create your own backyard paradise worthy of a magazine spread; all you need is some good old-fashioned DIY motivation and, of course, this handy on-trend guide! The following 42 DIY backyard projects are not only a breeze to accomplish but make for truly enjoyable summertime ventures. 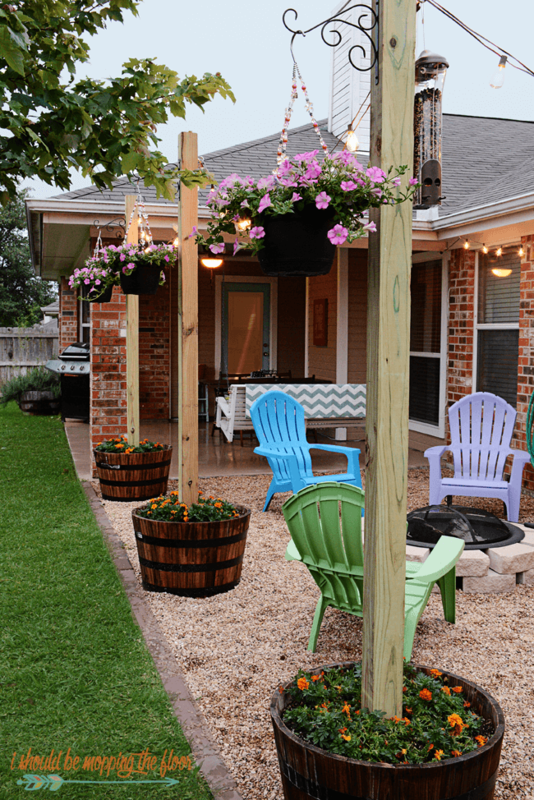 From repurposed patio furniture to handmade hanging lights, and even a bespoke fire pit or two, these DIY backyard projects are sure to inspire, as well as garner more than a few compliments from friends and neighbors. With easy to find materials–many of which you may already have on hand–and infinite possibilities, now is the time to make summer memories the right way: in style. 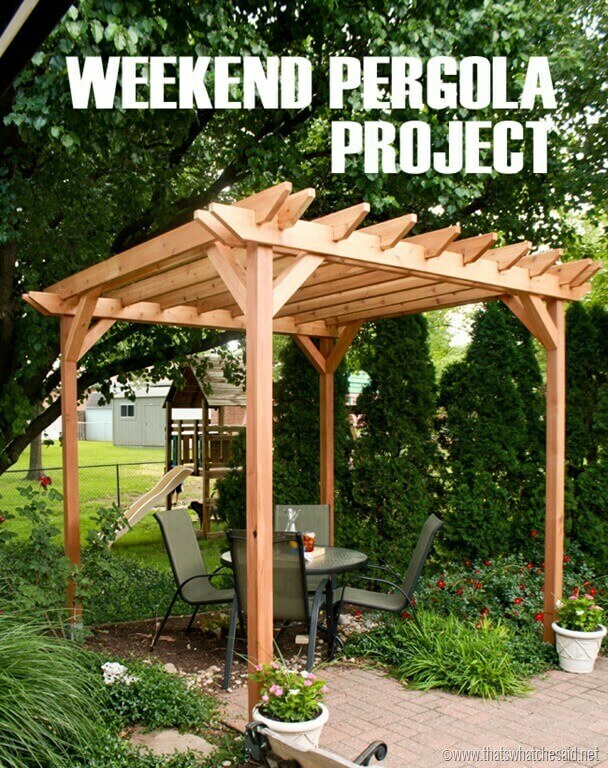 Your favorite backyard builder can put together this beautiful pergola for your garden. The graceful lines of this pergola will complement your yard and provide a great space for a dining table or a shady seating area. Having a pergola will give your yard an awesome focal point and impress your guests. It’s much easier than it seems to make a DIY crocheted hammock chair. All you need are dowels, macramé cord, rope, and some basic woodworking tools. Macramé is similar to knitting, but you do it with your hands. This chair will provide a comfortable, breezy place to sit and enjoy your yard. Building a fire pit can be done in just six easy steps. All you need is a fully dug-out hole in your yard, fire bricks, gravel, and paving stones. 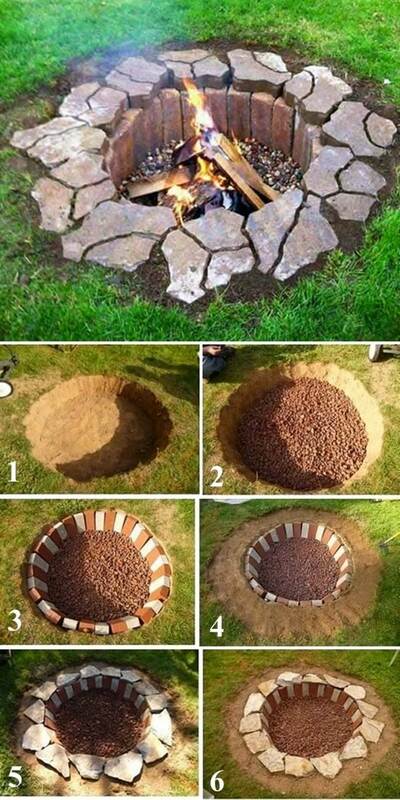 This fire pit project can easily be done in one weekend. For safety’s sake, make sure you clear the grass for several inches around your fire pit. Enjoy your fire pit with s’mores on a cool night. 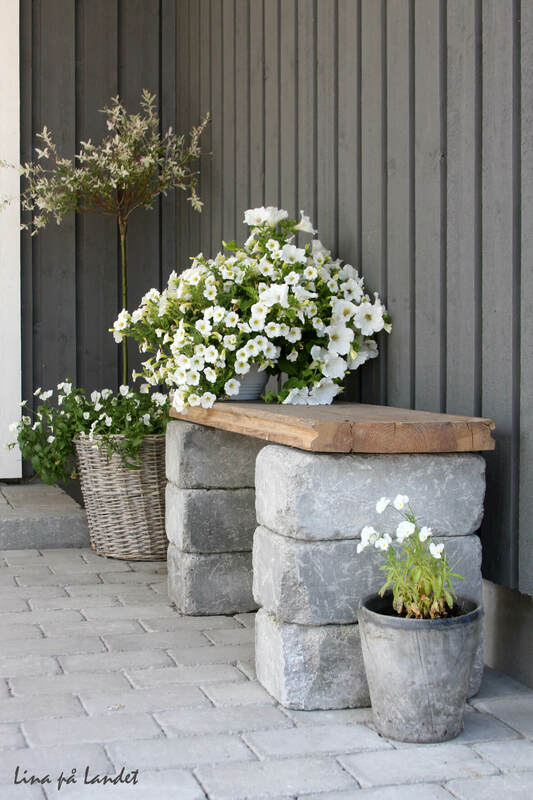 You can make this stylish and simple outdoor bench with cinder blocks and 4 X 4 wood posts. Assemble the sides of your bench with concrete adhesive. Paint the blocks. Sand the wood and feed it through the holes in the cinder blocks. This bench is great for the patio or at your poolside. 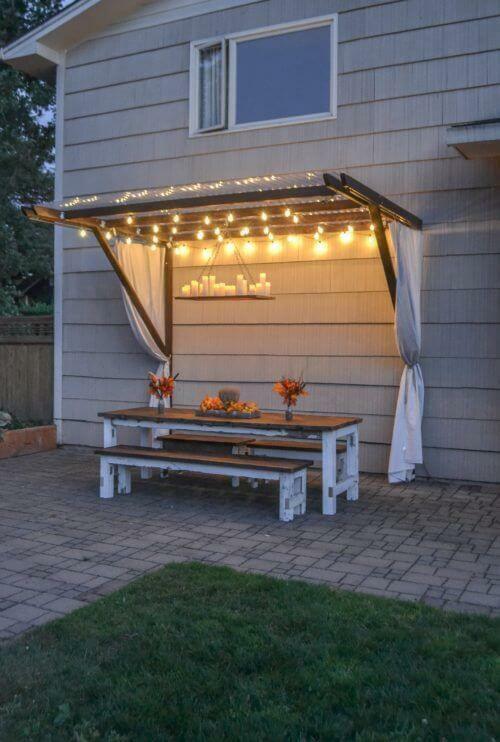 This beautiful awning style canopy is lit with elegant candles and globe lights. This canopy provides a centerpiece to your backyard and provides a peaceful place to sit and have an outdoor meal with your guests. This canopy is attached to your house for safety. The graceful curtains at the sides bring the canopy extra style. 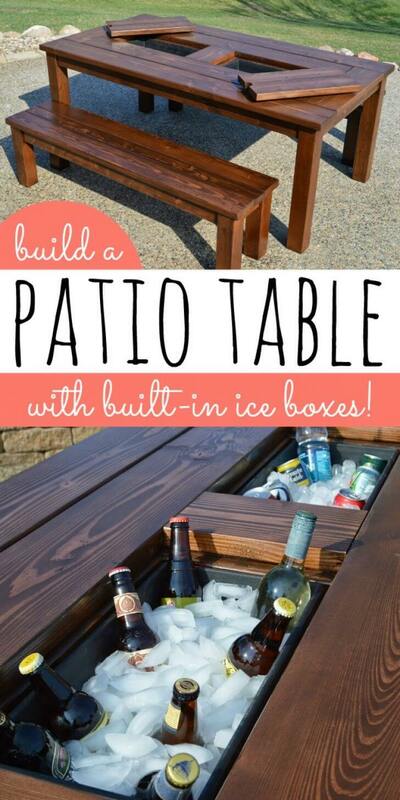 This awesome patio table has an exciting feature: built-in ice boxes. Your guests can reach for a cold drink without even having to get up from the table. There are covers for the ice boxes so you can use the table by itself. The table has two long benches for comfortable seating. Make a shady oasis for your yard by surrounding trees with an island deck. This is a simple project for an experienced woodworker. 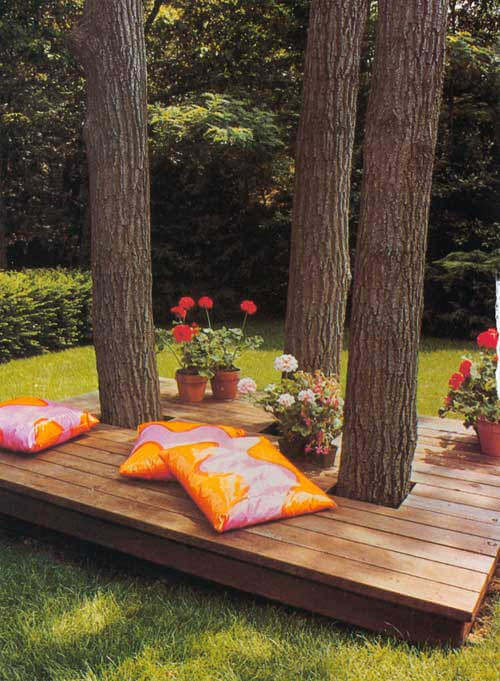 This is a great place to put flowers, as well as comfortable cushions for dreaming the day away. This novel project will set your backyard apart from the everyday. 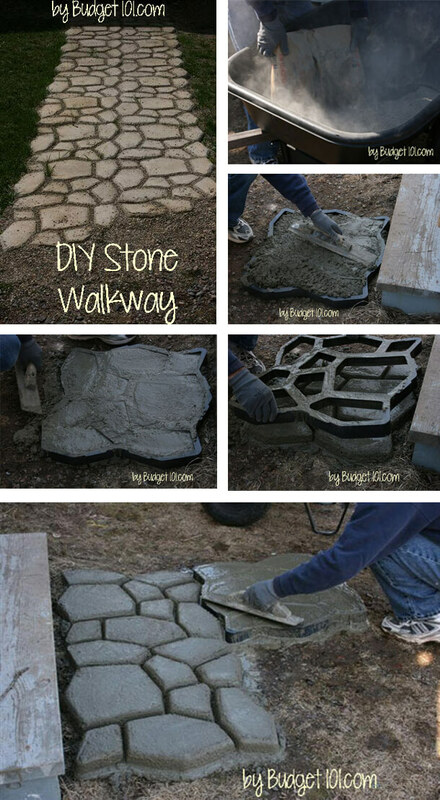 Use concrete molds available at the home improvement store to make your own distinctive paving stones. These stones have a charming, historical look that hearkens back to ancient times. You can make the paving stones in place by pouring the concrete, leveling it, and carefully lifting the mold off. Accent your yard with the relaxing sight and sound of flowing water. You can build a DIY pond in your yard using a small pool liner. Build up the sides of the pond with fieldstone and create a waterfall. Surround your pond with beautiful plantings. Your new pond will make a stunning accent to your backyard. Old tires can easily be made into comfortable outdoor ottomans. 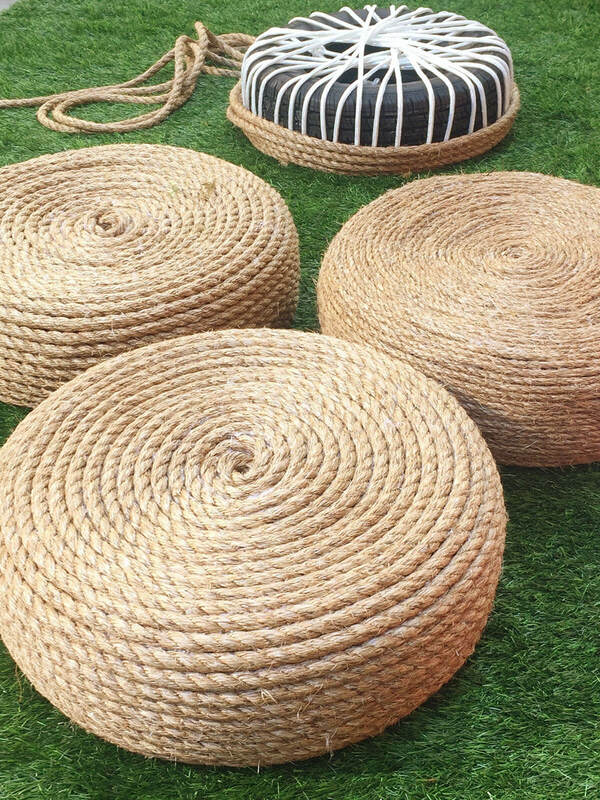 Simply wrap the tires in rope to make a seating surface, then coil rope around them for a fun, nautical look. This is a fantastic way to reuse something that may be taking up space in your garage. Make this adorable fairy garden in an oversized planter. This is an excellent project to do with a child. Find a miniature park bench, a little bird feeder dish, some stones, and a bounty of beautiful flowers. Let your child decide how to lay the garden out to attract magical fairies. This pretty wooden planter hides a coiled garden hose. It saves space and is much more attractive than a plastic hose winder. The hinged door in the front opens to take the hose out for use. There is a hole in the back for the end of the hose that attaches to the outdoor spigot. 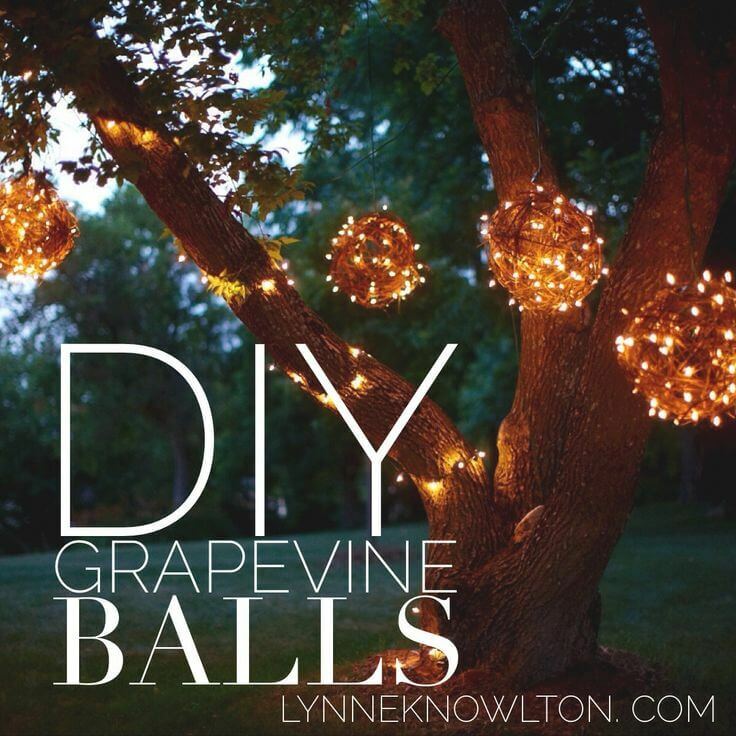 Grapevine balls are a stylish way to hang fairy lights in your yard. Grapevine is fairly easy to work with at home. All you need to do is soften it in water to bend it into the shape you want. Wind the grapevine into a large ball and cover it with fairy lights. Hang the grapevine balls from a tree for a fun and stylish look. Making a backyard patio doesn’t have to be complicated. This project has an unusual, eye-catching shape to bring visual interest to your backyard. Dig a circular area for your patio and add paving stones. 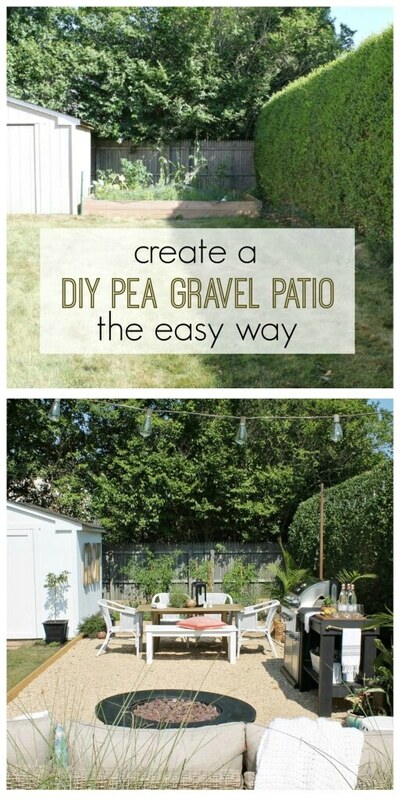 Surround the paving stones with gravel. Add chairs and a fire pit to make a comfortable seating area. Use barrel planters in a novel way by placing “lamp posts” in them. Hang gorgeous flowering baskets from the posts, and fill the bottom planters with annuals. 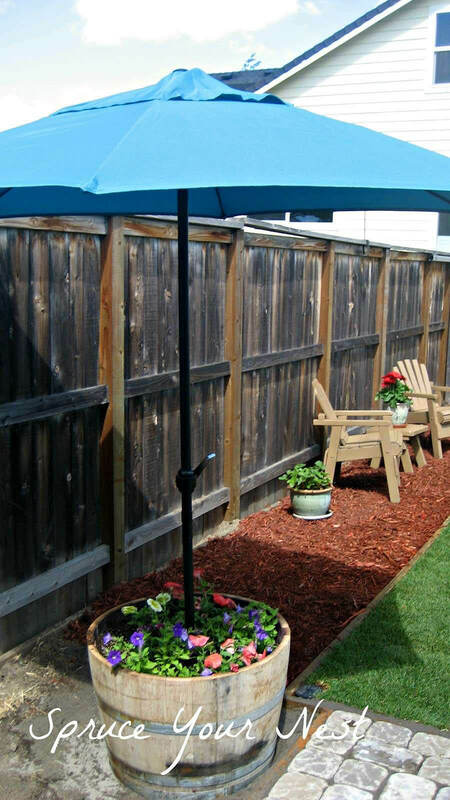 A row of these posts can set off the edge of your patio area and make a divider between it and the lawn. Moss letters are growing on the brick wall in this backyard. This exciting project will have all of your friends wondering how you did it. Pick a cool and shady corner to grow your moss letters. Make a moss blend with beer, sugar, and moss. Paint it onto your wall in the letter shapes you want. This project will definitely be noticed. This contemporary bench wraps around the side of a stone fire pit. The geometric look gives your yard a stylish update. 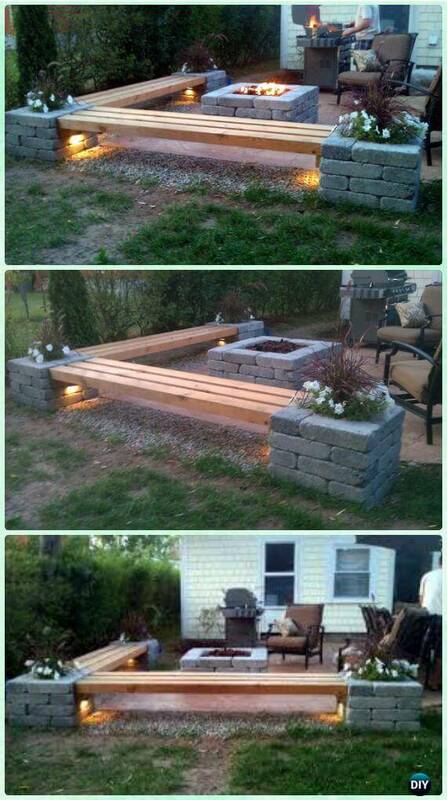 In the same stone as the fire pit, build pillars for the end of your benches. Add lighting under the benches for an attractive appearance and extra safety at night. Adding an extra touch to the basic wooden pergola, this project has integrated wires to make it easy to slide a cloth canopy for extra shade. The canopy is made from sail fabric or durable outdoor fabric. The canopy will add extra value to your pergola and make it a more inviting place to spend time on a sunny day. This easy project adds a shady patio umbrella to a basic whiskey barrel planter. All you need to do is to pour concrete in the base of your planter and then add the umbrella stand. This umbrella stand planter gives your yard a nice shady area for a chair so you can relax without getting too much sun. 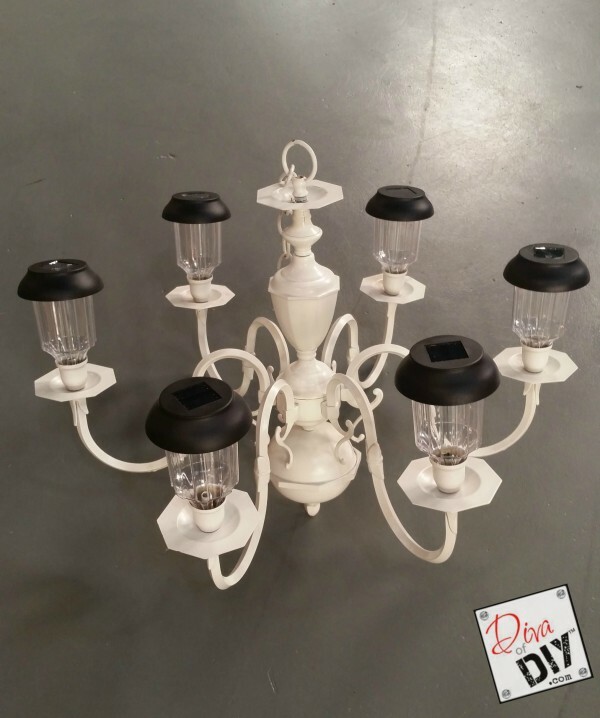 This upcycled chandelier replaces bulbs with solar lights from the dollar store. You won’t have to deal with electrical wiring or candles when you use solar lights for your chandelier. Simply remove the wiring and secure the solar lights where the bulbs used to be. Your new chandelier will make a lovely nighttime accent to your garden. You don’t need a tree to make an adorable “treehouse” for your children to play in. Put the “treehouse” on a platform instead. You can paint the inside to make it festive and add bright striped curtains to the front. 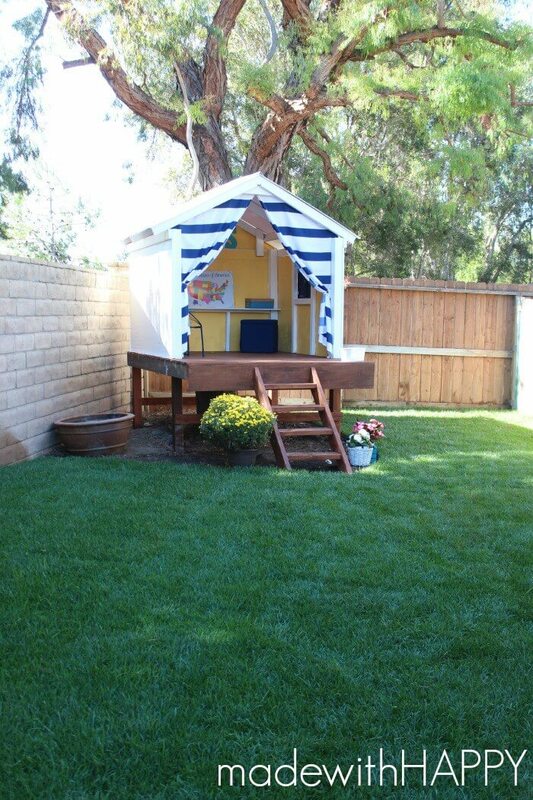 This playhouse is attractive and will keep your kids busy all summer. If you don’t have trees to hang your hammock from, build this easy DIY hammock stand. Any home woodworker should be able to tackle this project. The stand is made from 2 X 4s for inexpensive, sturdy construction. This design is just as attractive as store-bought hammock stands at a fraction of the price. Instead of digging out the area for a pea gravel patio, just put weed block fabric over the ground you wish to cover. This makes patio construction much easier and speeds up your project so you can enjoy your upgraded backyard. Add a grill, chairs, and a table for an attractive dining area. Use various kinds of upcycled wood to make these chevron pattern planter boxes. You can paint the wood before you make the box, or leave it as is for a rustic touch. These boxes are a nice change from the traditional wooden planter boxes that are available at the home improvement store. 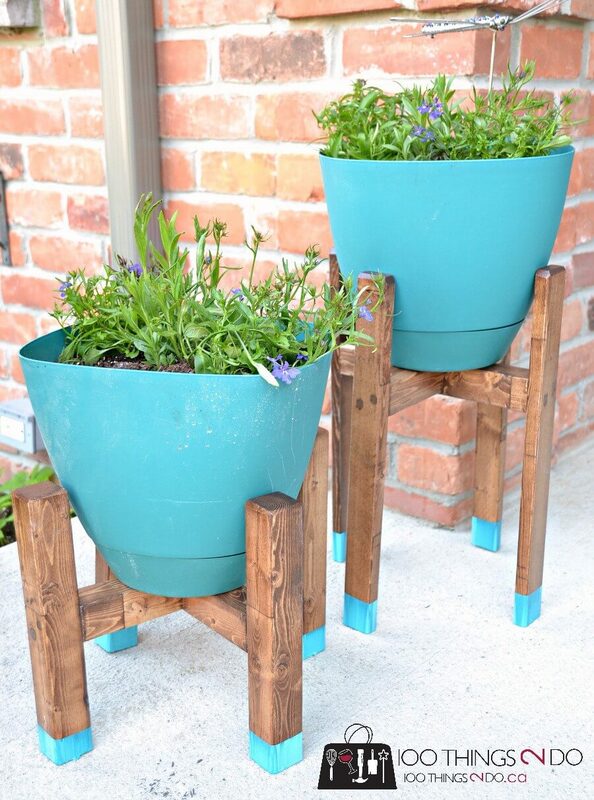 Use wooden stands to transform the look of simple resin planters from the home improvement store. For an extra stylish look, paint the feet of the planter in the same shade as the resin. Make two heights of planters for a visually interesting look. Fill them with gorgeous blooms. If you need a planter’s stand, construct this easy DIY version at home. This planter is in a sweet and charming cottage style to complement the décor of your backyard. This makes a practical accent to your yard. You’ll use it frequently to repot flowers. You can also use it for outdoor meal prep and serving dishes. It’s simple to place light poles in planters. 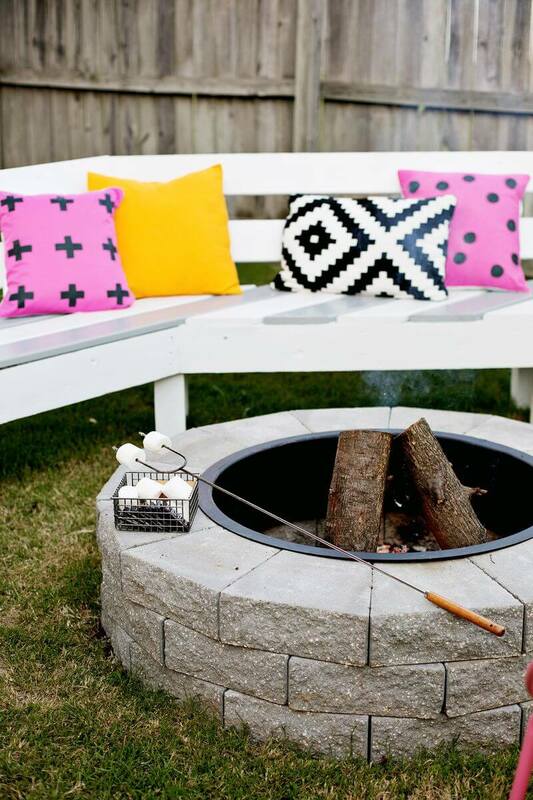 This DIY hack gives your backyard a charming look day and night. 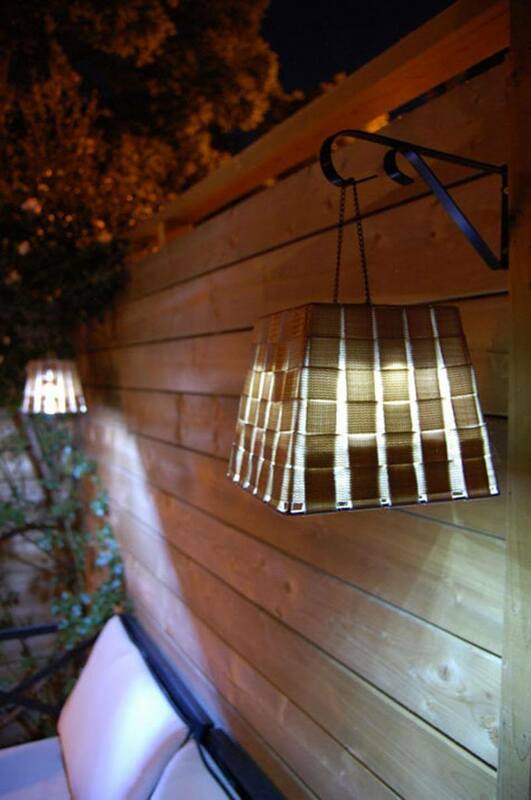 Garden lighting is trendy and makes your guests feel comfortable. Try accenting your seating area with these light poles. You can choose from many different styles of lights, from simple fairy lights to globe pendants. Make your own DIY burlap lampshade and bring a little bit of shabby chic design outdoors. All you need to do is find a square basket, perhaps a wastebasket, or a lampshade you would like to repurpose. Cover the basket with woven strips of burlap for a cute and charming look. This classic fire pit is easy to put together in a weekend. Use a metal fire pit ring and surround it with basic paving stones. Try finding different styles of paving stones to make this look your own. This makes a safe, attractive fire pit that will be the centerpiece of your backyard on cool summer evenings. This stylish louvered style deck box will bring your yard a touch of elegance while holding all of your backyard items. It’s great for pool cushions, garden items, and toys. An experienced woodworker would be able to put this project together in one weekend. You can paint or stain it for the look you want. 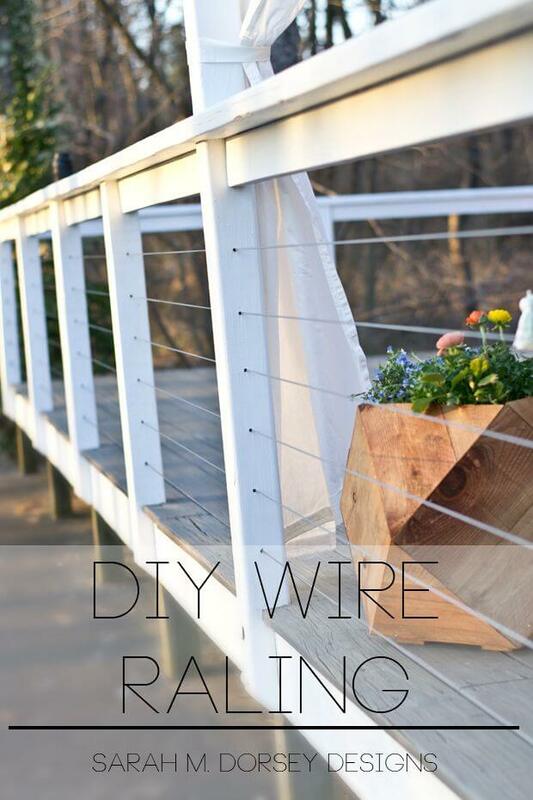 Give your deck railing a nautical update with this wire railing. It’s an easy way to add updated style to your deck while providing a railing that is safe enough for kids and pets. Simply drill holes in your deck posts to thread the wire through. Give it a new coat of paint and your deck is ready for a fun summer. This novel project will give your yard an impressive update. 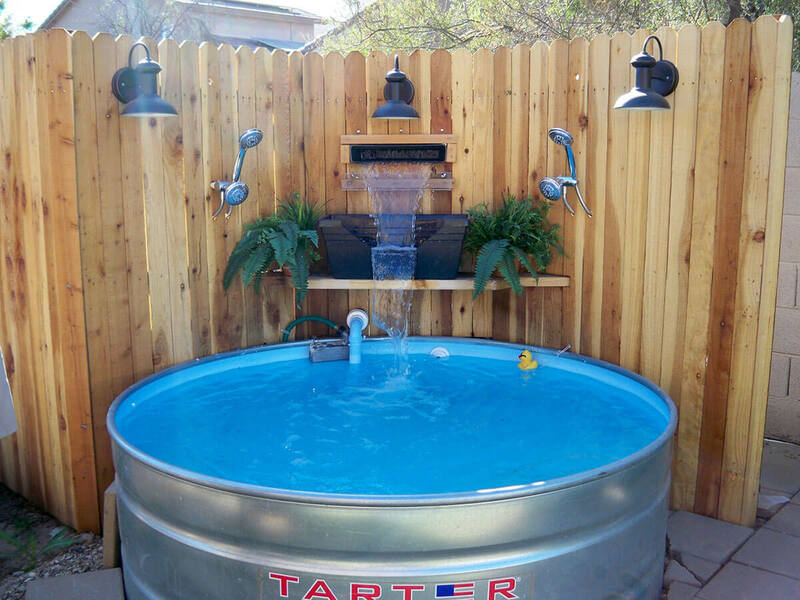 Use a large metal tub from the farm store for your pool. Add a filtering system behind the fence and make a waterfall that provides beautiful sound. This little pool is great for a cooling dip on a hot summer afternoon. An outdoor bar cart is a much-needed feature in your patio area. You could buy one, but it’s more economical and more fun to build your own. You can also add neat features like a covered icebox for cold drinks. 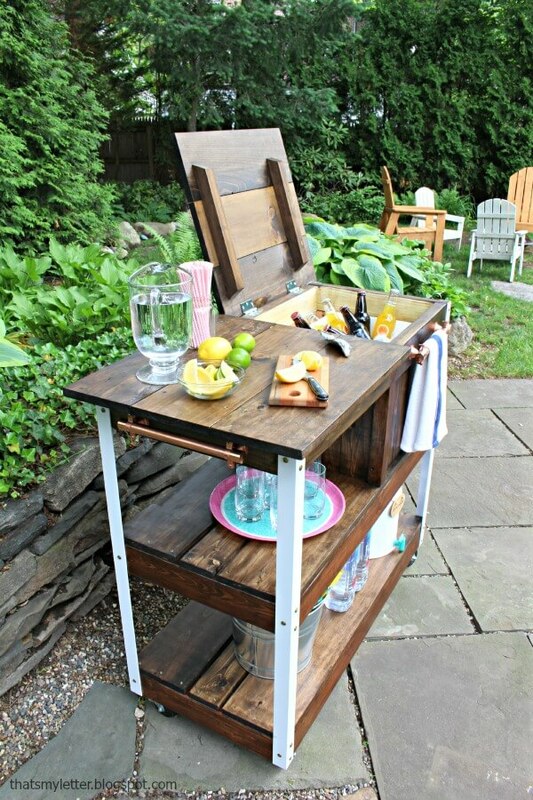 This cart would also make a great place to hold cooking essentials while you grill for your guests. Update your standard deck planters with tiki torches. All you need to do is pour concrete in the bottom of the planter and add the tiki torch. Add soil and make your planters bloom with beautiful flowers. Having tiki torches on your patio makes for a cheerful summer retreat and also keeps bugs away. 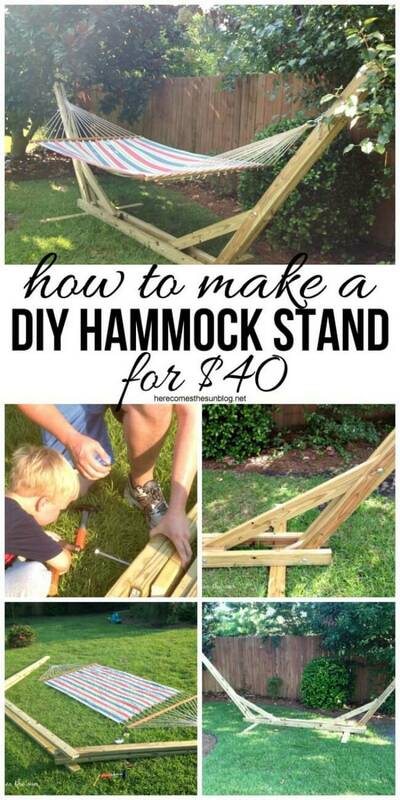 Make this traditional child’s swing for your yard. It’s easy with a few simple tools. Drill holes in the seat for the rope, and hang the swing from a sturdy limb. This swing will give your kids a low-tech way to enjoy the backyard and help them make lasting memories. Make this impressive grill surround with faux stone panels. It will look like an expensive built-in stone counter. Add a granite top for an elegant and practical work surface next to your grill. This project will definitely be noticed. It will be a great centerpiece for your outdoor dining. Over time, patio cushions lose their brightness and can even become worn. 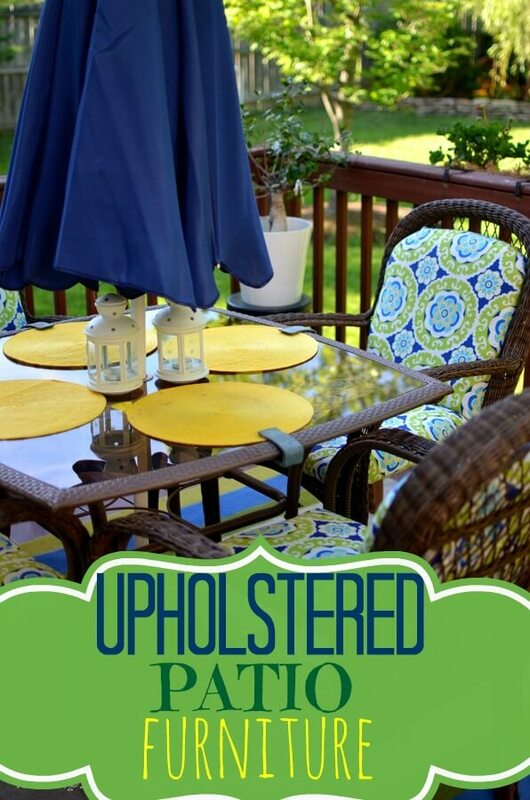 Update your old and tired patio cushions with new upholstery. You can choose a fun and stylish new fabric for your project. It does take some basic sewing skills to make this project work. You will save a lot of money by reupholstering your cushions, rather than buying new ones. This minimalist outdoor sofa makes a comfortable addition to your patio or backyard. The base of the sofa is done in wood, though it is painted to look like stone. This is a handsome sofa in an updated style. Choose gray paint and black cushions for a sleek look, or you can dress this project up by painting it in any color you wish. 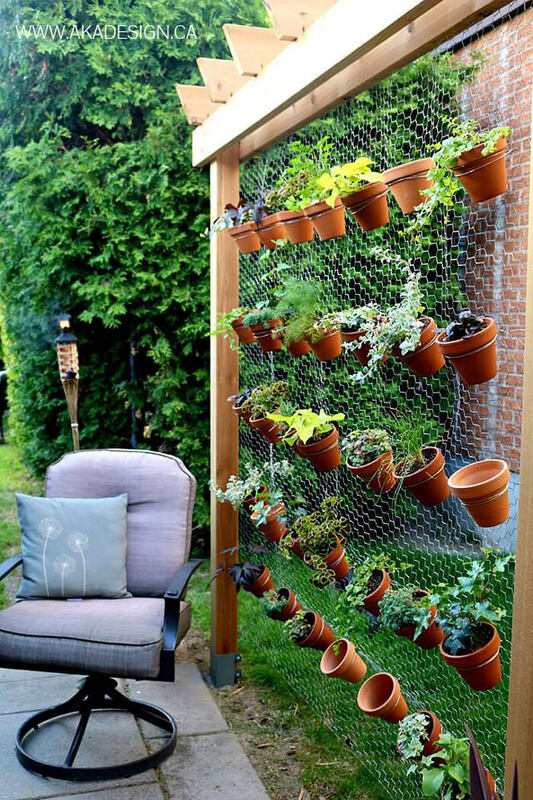 This DIY vertical garden is made from chicken wire for a fun, quirky touch. It’s simple to build and provides much needed greenery to any corner of your backyard. This is a fun alternative to a traditional fence if you want a little privacy when you are outdoors. Hang pretty flower pots on the wire. It would also make a great kitchen herb garden. This is another out-of-the-box idea for repurposing traditional deck planters. All you need to do is flip your planter over and paint it. Turn the saucer right side up and place it on top of your planter. You can wrap rope or cord around the top of the planter for a different look. A simple stone bench provides a place to sit or a place to put your favorite plants. The bench is held up by plain, oversized stones with weathered edges for a rustic look. Add a plank across the top for seating or for a shelf. You can make this match your paving stones or contrast it.